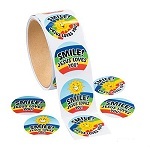 50 'Smile Jesus Loves You' Stickers. A useful essential for Sunday Schools, ideal for rewarding children or decorating books and pictures. 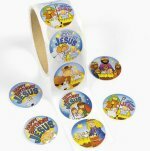 Stickers match our 'Jesus Loves You' range. Stickers measure 38mm. 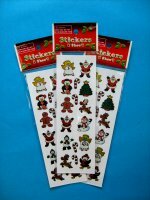 1 Christmas Sticker sheet. 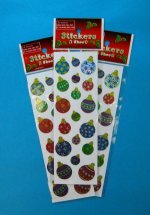 A selection of 18 fun prism Christmas bauble stickers on each sheet. Each sticker is approx. 2cm and smaller. Ideal for Christmas fun and cards. 1 Christmas Sticker sheet. 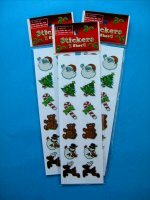 A selection of 27 fun iridescent Christmas themed stickers on each sheet. Each sticker is approx. 1cm. 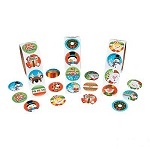 Ideal for Christmas fun and cards. 1 Christmas Sticker sheet. A selection of 12 fun prism Christmas stickers on each sheet. Each sticker is approx. 2cm. 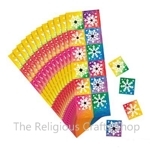 Ideal for Christmas fun and cards. 1 Christmas Sticker sheet. A selection of 16 fun prism Christmas stickers on each sheet. Each sticker is approx. 2cm and smaller. Ideal for Christmas fun and cards. 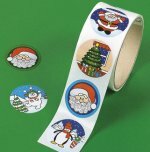 50 Stickers - Fantastic value Christmas fun stickers. A range of different designs which kids will love. 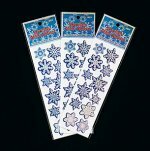 Use them to decorate cards and envelopes. Stickers measure approximately 4cm. 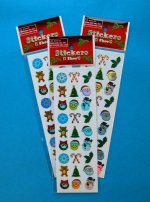 50 Fun and Colourful Christmas Stickers. A great buy in preparation for Christmas. Ideal for giving to children or for decorating cards and presents. There are a variety of designs and it will be a lucky dip pack sent, unless a particular design is specified. Stickers measure 38mm. Cute Kitty-cat Stickers. 50 Stickers with different designs. 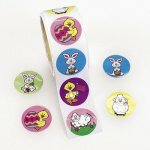 Purr-fect kitty Stickers are just perfect for sealing envelopes and a hit with little children. Stickers measure approximately 4cm. 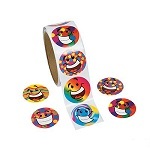 Pack of 50 Funky Face Stickers. 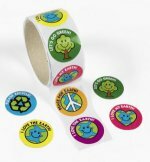 These stickers are great for rewarding children and appeal to all ages. 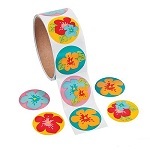 Stickers are bright and cheerful, measuring 38mm.